So, I’m a couple months away now from my One Year Blogiversary. It feels like it’s been a long and hard road, having many ups and downs, and many days I feel like giving up on my blogging journey, but my husband’s inspiration keeps me going. I took up blogging as a hobby and really enjoy sharing information about design, writing about my home projects, home renovations and home ideas in an effort to inspire others. The part about blogging, I find the most disheartening is the lack of engagement from readers. I realize most of you don’t know me, and you don’t owe me anything. But if you do like the content, if you are inspired by what you read, if you have taken one of my suggestions and acted on it (in any way), I would love to hear from you! Please leave a comment letting me know. Feeling appreciated lifts people up, and knowing we are making a difference motivates us to continue. I truly appreciate each and every comment left, and every “like” received. I also realize success shouldn’t be measured by how many “likes” one receives but I would be happy knowing if what I am writing is impactful at all, which will motivate me to continue. I would also like to hear your thoughts about posts you would be interested in reading about, I am open to suggestions. 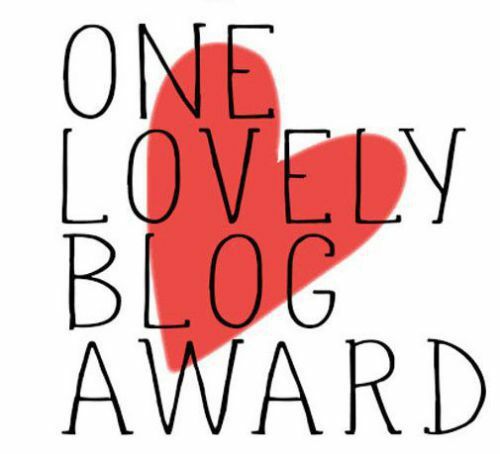 I am humbled and honored to be nominated for the “One Lovely Blog Award” by my friend at Abbey Co. (HERE)! Thank you for the nomination. Nominate up to 15 people. Let your nominees know you’ve nominated them. My parents immigrated from Europe before I was born, making me first generation American. I have two amazing children, a 13 year old daughter and a 9 year old son. Hanging out with family and friends is very important to me, and I love entertaining. I have a potty mouth (but never in front of my children). My husband of 15 years is my best friend. First of all congratulations for the 1st award I presume. About the interaction part, well the first 500 followers are always difficult in the blogging. You need to have 2 step strategy, first to have a blog post part and the 2nd is to have the followers come to you blog which is more important in the initial stages specifically. Some niche have a difficult task of bringing the bloggers towards you. I can share my part, so that if you like you can adopt and try it. I started this blog in 2013, from that time till March 2017 I have hardly posted 7 blogs and have less than 10 followers. But than I came back and want to write where I left, this blog was all about self discovery and what I like. But what I did, I went to other people blog in the start and write over there my view for their blog, from that I got audience of the respective blogger a lot. So your strategy, should be to focus on your followers blog so that they can communicate to you back, plus other readers from their can relate to your honest feedback. Honest feedback doesn’t mean good blog or something like that. But going into depth of that blog and try to pull anything to comment on it. I am sure you will have the blog running at your end. Thank you for the wonderful feedback.I really appreciate your input, you highlighted some good points about other blog posts. I will definitely put your suggestions to good use! Atleast till 500 followers, you need it have double edge sword strategy. Also think from follower prospective and other from the same niche. Think outside the box, sometimes we think a particular post is excellent but the viewership is not generated. It happened intial days are tough. It’s says first 100 than 10,000 than first million and than 1st billion is always difficult. Do go to all who likes you or go generally to any blog to make a point to like their blog with a good honest comment. As an example your this post. Trust me, when you reach 1k + follower, you don’t have time to follow all or read all of them. So your trusted blogger becomes your buddy and so your encouragement gather. Make friendship. I am blessed to make wonderful blogger friend who share personal things although we don’t know each other. But a heart to heart connection exist. Keep shining and don’t take stress, nothing in the world is not conquerable and nothing in the world is easy!!! Thanks so much for thinking of me. 🙂 I have a cast on my arm but it is supposed to be removed tomorrow, so as soon as it’s gone, I will begin catching up on my blogging. This Lovely Blog Award will be a priority. I am a new follower to your blog and I do enjoy it. Blessings. I’m sorry to hear about your cast, but looks like you are recovering well. I enjoy your blog too and look forward to reading future posts. Good morning. I responded to the Lovely Blog Award. Thanks so much and thanks for being so patient. Blessings and have a great weekend.